Anyone remember the Road Sign math site at http://www.roadsignmath.com? It's been dormant for quite awhile. Maybe we should resurrect the topic here. sure; this is a good way of bringing in other sign photographs that are not shield related. here is a rule for continuity ... all posted photos must obey the math rule, as seen on that website, and furthermore one number from the previous photo must appear in the next one. the math rule, in short, is you have to take a single sign (in our case, let's extend it to a single gantry if you want, as long as all the signs are facing one direction) and using all the numbers exactly once, write an equation that is correct. I'll start off with something simple. next poster has to come up with another photo that has at least one 2, 8, 9, or 10, and of course a correct equation. Good good? yes yes. Where is Carol Vorderman when you need her? So can we break up numbers into their component digits? I got the impression the Road Sign Math site didn't do that. for now, let's go with all numbers to be treated as they are, but if we have trouble coming up with examples (the Road Sign Math site hasn't been able to find one in two years ) then we can relax the rules. Road Sign Math didn't require the "use a number in the previous example" bit, but I understand this site is a bit different. RSM used to be on some different format but changed to the blog-style format (I think they use WordPress) shortly before going dormant. And I had a bunch of examples to send to them before they assumed room temperature. Thanks for that reference, HB. I see now that my earlier work violated the rules since 101 occurred twice and I used it twice. I JUST noticed that 199 the left side of the photo. O.k. I just re-read the rules and saw that I actually should have used 101 twice since it appeared twice in the photo, so my math did follow the rules. We should try to be creative and have fun with this game. In fact, this game might be a little more fun if one person posts a sign and have others try to find a math equation for it (the poster should already know one exists). Any thoughts? OK, here's an easy one for you. Actually, all numbers used (including the sum) must be included on the sign and all signs must be on the same assembly. That's why, in the RSM game, two or more signs on independent posts wouldn't count unless there was a stabilizing bar installed. I remember submitting a sign to RSM and it being rejected because of this. 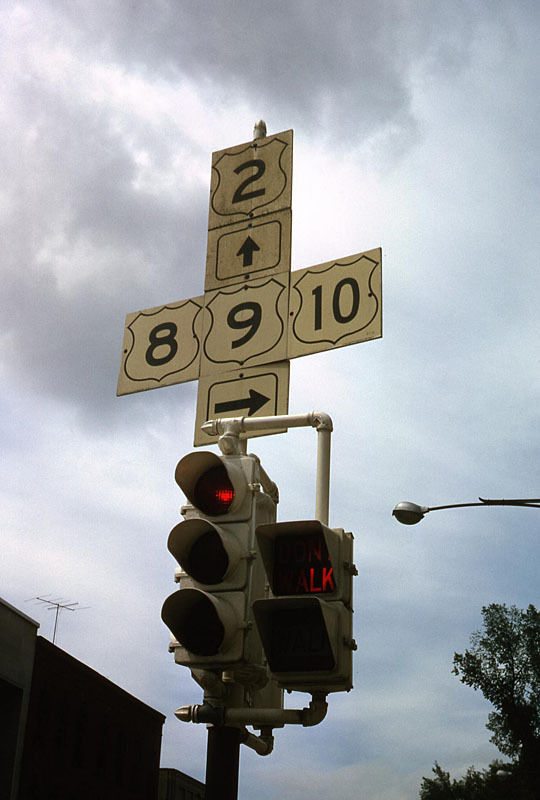 Then during a sign replacement project, a connecting bar was added and the sign assembly became eligible. There was no 1 or 14 on the sign; I know you got them from the bridge height warning sign in the background but the only eligible numbers were on the BGS. 2 x 3 = 6. There's another candidate just a few miles up the road from that sign on I-90 in Pennsylvania. You're probably going for 1 + 1 + 2 = 4, but you can't split numbers up in a sign, according to the original RSM rules. "12" is "12," not "1" and "2." Cool, because a variable would make all the problems really easy.